This AEC Regent V with East Lancs (Neepsend) H66R bodywork was new in 1965 to Southampton City Transport with fleet number 371. Some of this delivery (358 to 370) were to have been 358 HCR to 370 HCR, but were caught in the change to year suffix numbers. Indeed, some of them even failed to have their booked BTR …B marks, and gained BOW …C plates instead. BOW 507C isn’t one of those so marked in the fleet history by A K MacFarlane-Watt. 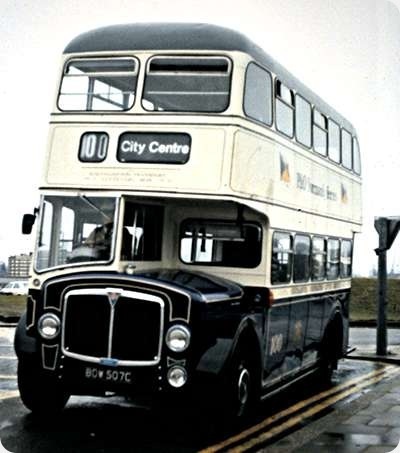 In this view, on the soggy afternoon of 1st February, 1979, she has been repainted in the 1930’s livery and renumbered 100 for the operator’s Centenary, and is being positioned outside Civic Centre for the Committee inspection. My then boss, the City Architect, said he had commented to the Transport Manager that it looked very nice, but asked "Why the P&O advert?". He said that Bill Lewis replied, "They paid for the repaint." At the end of the day, it all comes down to personal preference. I’m not a lover of tin fronts, most tend to look a bit harsh, and some are positively brutal in appearance, but the AEC seems to buck that trend. A few round edges and a bit of bright trim makes all the difference. Mind you, when a bit of neglect sets in where badges go astray, or trim is painted over, or bits are removed and not replaced, well that’s another matter entirely. Thank you, Ronnie. I suppose that – having grown up with the Regents of Morecambe & Heysham corporation – the arrival of the Regent V was something of a shock. I wonder if this is why some places didn’t go for this ‘new look’ and stayed with the exposed radiator on their Regent V fleets. I always think that there was something Macho about the preference for exposed radiators- a touch Mack or Peterbilt, or deferring to the traditional Atkinson. 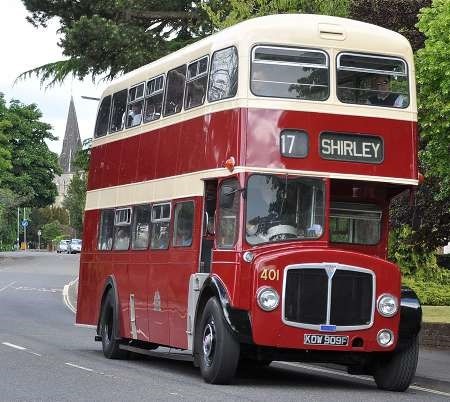 Doncaster only ever had fibre-front CVG’s- Leyland and AEC deckers were exposed radiator until the half cab was bustled away. Thanks, Joe. A "real" Scammell, perhaps, or the Thornycroft Mighty Antar, with the snout, rather than those designer products from their latter years . 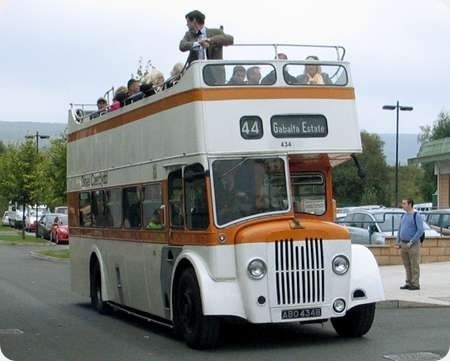 . .
ABO 434B was originally closed top but as can be seen has since been converted to open-top for tours of Cardiff City and special events. The reverse livery really does justice to this superb vehicle. It was a popular ‘runner’ at the Bus & Coach Wales 2014 event in Merthyr Tydfil carrying healthy loads on some hilly terrain. Thanks for the photo Les. My wife and I went on a BR Merrymaker Excursion from Sheffield to Cardiff in the late 70s. We found 434 on the Cardiff City Tour so we had a very pleasant ride on the top deck – bit cool, I think it was April time.I have some black and white photos taken on the tour somewhere. 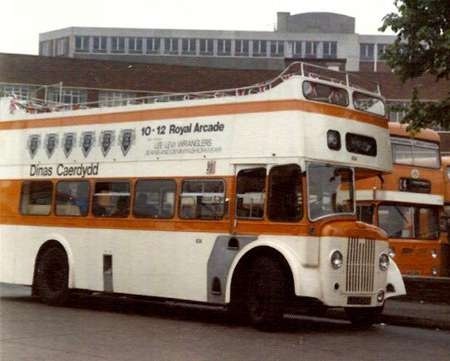 I’ve found this photo I took of 434 back on the 24th June 1977 at Cardiff Central bus station. The only difference between this and the recent photo appears to be the advertisement.